SciFiNow spoke to Daniel Falconer, Weta Workshop designer and author of The Hobbit: The Desolation of Smaug: Unleashing the Dragon (order it here if you haven’t already) about the process of creating what he describes as “the grand-daddy” of fantasy dragons. He also reveals what Benedict Cumberbatch brought to the role, and why he feels Peter Jackson understands exactly what is required from a fantasy epic. Don’t forget to click the link to read the entire interview. 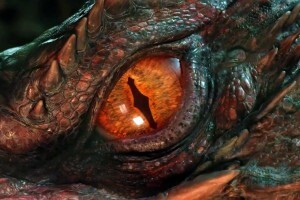 SciFiNow: Dragons seem to be enjoying a bit of a renaissance these days; what sets Smaug apart? Falconer: I think Smaug is special because, at least as far as western dragons go, he really is the archetype upon which all modern fantasy dragons are based. It was something everyone at Weta was very mindful of when the first forays into designing him were being made. He had a lot to live up to. There have been many great dragons on our screens over the years, but I personally always felt that many of them owed a lot to what Tolkien imbued in Smaug. Those qualities have influenced the evolution of most western dragons since. Smaug is an object of awe and dread. He is ruthless and cruel, cunning and proud, avaricious and predatory, but his power and savage beauty are also attractive. I think we are drawn to Dragons because throughout our histories and fantasies we have tended to ascribe great power to them. Something actor Benedict Cumberbatch said when I interviewed him for the book really struck a chord with me when he observed that Smaug’s allure is actually seductive. The sheer power and superiority he exudes over everything else in his world is seductive, but it is also corrupting. So, I think part of Smaug’s specialness and why we were all so looking forward to seeing him on the big screen has to do with several decades’ worth of build-up. We have seen so many wonderful dragons, but this guy is the grand-daddy of western fantasy wyrms. SciFiNow: What were the pressures of bringing such a popular creature to life? Falconer: With great expectation comes great pressure. If there was one common factor I found in talking to everyone associated with creating Smaug for the screen, it was an eagerness to live up to the vision conjured by Tolkien’s characterization. This dragon had to be truly jaw-dropping in every way. That was the artistic pressure at work, the striving for excellence that, on a project involving hundreds of people, is infectious and has a way of yielding something greater than the sum of its parts. But there was also the technical pressure. I’m a writer and designer, so I’m no expert when it comes to technology of special effects, but I learned a lot as I was researching and writing this book, talking to my colleagues at Weta Digital, Weta Workshop and Park Road Post. Peter Jackson imagined Smaug on a truly colossal scale. If he were a living, physical being he could waddle out to the airport and stretch out his wings to shade a 747 jumbo-jet under each one with room to spare, but the camera also had to be able to get very close to him, zooming in on his bus-sized head or just his eye and still read detail and complexity. That meant sculpting and painting in all that minute detail that makes a digital creature feel real, down to the last tiny scale, on something with a vast surface area. Every scale was created by hand. How much would be texture mapped and how much would be sculpted into the model itself? Was it even possible in the limited time frame of movie production? And would such an information-heavy model be unwieldy to animate and render?